To send a custom email you need to be an employee. Click on the 'Send Mail' link in the "more" menu of the header. 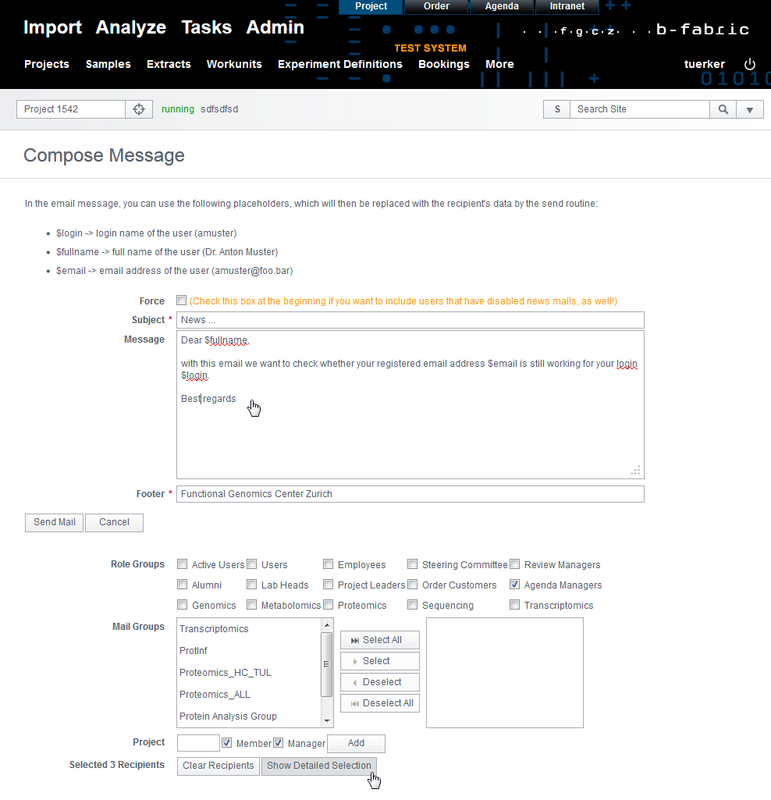 Hint: users have the possibility to block automatic notification (news) mails from B-Fabric. To reach those people anyway you have to check the 'Force' checkbox. This feature is only available for users with coordinator role and should be used only for critical emails, e.g., informing the users that FGCZ charging policies have changed. IMPORTANT: Please be careful when you cut&paste text into the message box, especially when you cut from a rich format document such as word. Ensure that the text does not include formatted special characters, e.g., special hyphen symbols other than - or special quotation symbols other than " and '. Additionally, you may select users by project membership by entering project id, checking the Member/Manager checkbox, and clicking on the Add button. You may unselect user groups unchecking the corresponding boxes. 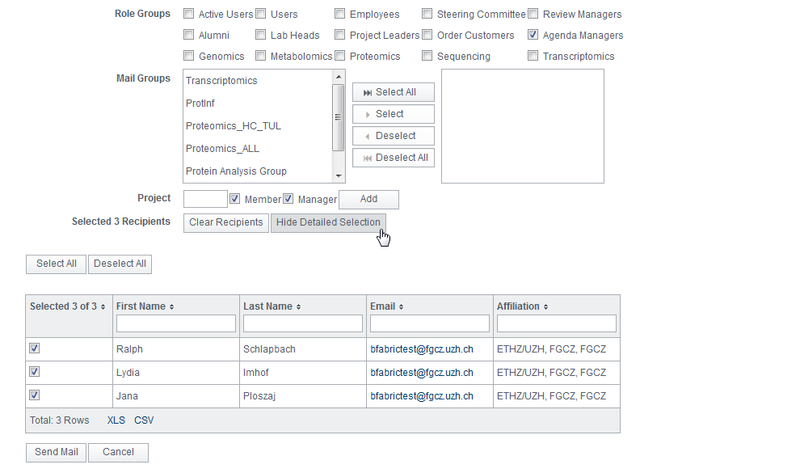 Then, all users of the unchecked group are removed recipients list unless they are selected via another group. You can also remove all users from the recipients list by clicking the Clear Recipients button. To see or hide selected users click the 'Show Detailed Selection' or 'Hide Detailed Selection' button, respectively. Using the detailed selection, you may individually remove single users from the recipients list. Finally, when you have finished your recipients list, click the Send Mail button to send the mail to all selected users. Created by martilu. Last Modification: Thursday June 5, 2014 11:10:50 CEST by tuerker.